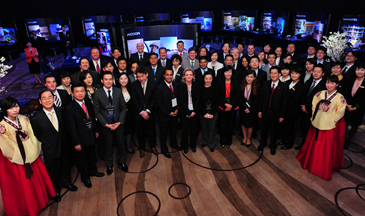 On April 15, the 2010 World of Accor Expo was held at Champagne Room of Novotel Ambassador Gangnam. The expo, also known as WOA, is an advertising and sales promotional road-show with target of outbound market in Asia Pacific introduced by Accor Group which operates over 4,000 hotels worldwide: Sofitel, Novotel, Mercure and Ibis. This year’s WOA, celebrating its 6th event, started in Hong Kong on April 13 and featured in Seoul on April 15 and followed by Tokyo, Osaka, Beijing, Shanghai, Bangkok, Singapore, Jakarta, Sidney, Auckland and Mumbai. The Seoul expo, held on April 15, was joined by key VIPs from the headquarters of Accor Asia Pacific including Mr. Michael Issenberg, the Chairman and Chief Operating Officer – Accor Asia Pacific, Mr. Graham Wilson, the Senior Vice President Sales & Marketing – Accor Asia Pacific, Ms. Charlotte Gutte, the Regional Director of Sales – Accor Asia, Mr. Patrick Basset, the Vice President Operations – South Korea, Vietnam, Philippines & Japan. Also, representatives from around 20 hotels in Asia Pacific were actively engaged in PR activities for their hotels. including free accommodation and dining. ‘We have successfully raised the brand awareness in Korea after 6 WOAs and will continue our commitment to the WOA in major local markets where Accor is present’ said Mr. Michael Issenberg, the Chairman and Chief Operating Officer of Accor Asia Pacific, during his interview with media. Accor is a global leading hotel operator and currently operating over 4,000 hotels worldwide. In Korea, Accor is operating 9 hotels; 2 under Pullman (Grand Ambassador Seoul Associated with Pullman & Pullman Ambassador Changwon), 4 under Novotel (Novotel Ambassador Gangnam, Novotel Ambassador Doksan, Novotel Ambassador Busan and Novotel Ambassador Daegu) and 3 under Ibis (Ibis Ambassador Seoul, Ibis Ambassador Myeongdong and Ibis Ambassador Suwon) with partnership with a Korean hospitality leader, Ambassador Group.